I have been a HUGE fan of author Charlie N. Holmberg’s The Paper Magician series (even though I’ve only reviewed the first one, I’ve read and listened to the audio books three times). I’ve convinced others that I thought would enjoy the books to give them a read and everyone’s returned quite pleased with my recommendation. So when I saw that Holmberg had a new book out, I was elated and eager to enjoy her magic once again. Except this time I didn’t. In a remote town, probably in Russia, a fifteen year old girl, Matrona … no, wait … she only acts like she’s fifteen … 26-year-old Matrona is mooning over the fact that she isn’t loved by her betrothed and she has her eyes and heart set on another lad in town. Meanwhile, she discovers that a neighbor has a secret room and inside that room are nesting dolls and that there is one that looks like each resident in the community, including herself. The neighbor, Slava, mysteriously suggests that Matrona should plan to become the next caretaker of the dolls and their magic. Magic? Oh, yes. To prepare Matrona for the task, Slava instructs the girl to open her five nesting dolls. But she can only open one doll every three days. Once started, to do otherwise could bring a tremendous calamity to the individual. Matrona slowly gains Slava’s trust and Marona in turn shares the secrets she learns with Jaska the butcher with whom she is in love. Revealing the power of such magic with someone not ready for it – both Slava to Marona and Marona to Jaska – is a recipe for trouble and the entire community will suffer. It will be up to Matrona to grow up and to step up and save the town. I give Holmberg a lot of credit for really stepping out and developing a story around a very unusual object. She did this in her Magicians series and is doing it again. I like the idea quite a bit, but the characters don’t live and breathe as well in this book. While Matrona as a character grows through the course of the book it has a lot to do with how immature (and annoying) she is at the beginning. Slava, who plays a major role in the story, is too one-dimensional to really be effective in propelling Matrona and the story. I really would have liked to have him be stronger and more of a force. The magic got messy and convoluted for a while, though I really liked the very ending. Looking for a good book? 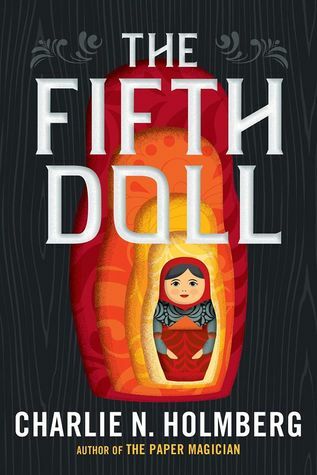 The Fifth Doll by Charlie N. Holmberg is a decent read, but not a true recommend-worthy book as it just doesn’t have a lot of strengths.